The Dallas Solos this year offered piping and drumming workshops, solo piping and drumming competition, and quartet competitions. Not bad from a handful of pipers in a couple grades. Well done Nancy, Eddie, Stew and everyone who had a hand in organizing the event. Saturday afternoon, after the workshops, is when the solos began. Jimmy adjudicated grade 2, 4jr., and pc. Chris had grade 1, 3, and 4 sr. The competition was held indoors and outdoors - my events were indoors - but space was limited. I began warming up outdoors and tried to find a place inside. A bit before hitting the boards I was able to slip into the exercise room. The chanter sounded good , but by the time I was in front of Chris a few notes were out again. So I played a wee tune to try and bring it back and hoped for the best. Chris likes to start with the 6/8 which is a nice change up. 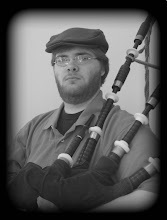 The 6/8 came out well, though the chanter wasn't really settled. The other tunes went well. I changed my jig and played "The Curlew" for the first time in competition - I was really happy with how I played it too. Oh, and the chanter finally settled for the jig!